What makes a great public speaker truly great? Luckily for the not-so-natural speakers among us (in other words, most of us), speech coaches say the most important presentation skills can be learned. From slowing down the pace of speech to eliminating pesky “ums” and “ers,” there are plenty of tricks for speaking with aplomb in front of an audience. We consulted several vocal coaches who routinely work with business leaders and executives to find out how they take people from public speaking novices to pros. Below, are their best tips. 1. Record yourself and play it back. The first step to becoming a great speaker is learning how you sound to other people. Thanks to smartphones, computers, and other technology, this is very easy today. Sandra Kazan, a voice and speech coach based in New York City, says the first thing she has each client do is make a video of themselves speaking. Hearing themselves “gives them pretty powerful feedback,” she says. 2. Identify and break your bad habits. Once you’ve made the recording, experts say you should listen to it carefully and identify all the things you dislike about how you speak. Two of the most common issues are filler words (“um,” “er,” “uh”) and trailing off at the ends of sentences, which makes you seem less confident. To break these habits, Kazan tells her clients to write the bad habit on a note card, strike it out with a line, and place the card on a desk, near the telephone, and in other places as a constant reminder. 3. Be aware of your body language. John West, head of the speech division at New York Speech Coaching, says the first thing he assesses with clients is body language. Often, he explains, amateur speakers will fidget, shift their weight uncomfortably, and generally behave in ways that show they’re nervous or defensive. To fix this, he tries to help people find positions that look natural and echo stances we take “when we are comfortable and open.” For example, speakers shouldn’t cross their arms (which is considered a defensive pose) and are encouraged to use hand gestures for emphasis. Some people feel insecure about their speaking voice because of its pitch. They think it’s too high or too low, or somehow doesn’t feel right. Kazan says everyone has an ‘optimal pitch’ that should be used for their natural speaking voice. To find it, she says to make the “mmhm” sound of agreement. The pitch you strike in that is the same register you should speak in most comfortably. Many novice speakers will rush through their words, making them hard to understand. Generally, speech coaches advise people to slow down, but there’s no word-per-minute count they recommend as the ideal pace. Rather, West says he encourages clients to speak at what he calls the “rate of no mistakes.” The exact speed will differ on an individual basis but should be considered a rate at which the person can communicate without errors, stammers, or filler words and keep the flow of speech continuous. 6. Take advantage of pauses. Vocal coaches agree that repeated and filler words like “um,” “er,” and “uh,” find their way into speech because people fear letting silence interrupt their phrases. But West says that silence and pauses are one of the best-used tricks of great speakers. Rather than lose the listeners, a well-placed pause can give your audience a chance to process what you’ve already said and pique their interest in what you’ll say next. 7. Focus on continuity of phrase. How do you know where to place those pauses and when to draw breath? West advises thinking in terms of phrases. “Think about speaking from one punctuation mark to another,” he says. Figure out where the commas, em-dashes, periods, and other break marks would fall in your transcript. And then make sure your audience knows they’re part of your delivery. 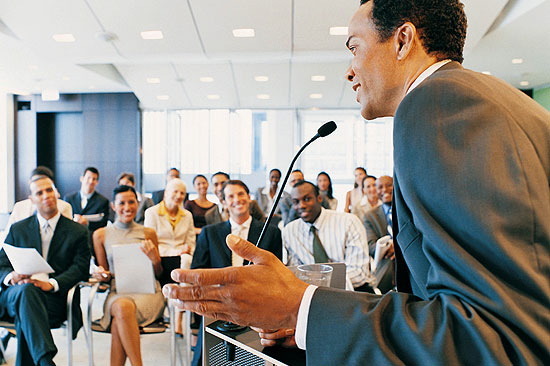 Almost every common public speaking problem is linked to lack of breath. Most often, people get nervous talking in front of a group and hold their breath or tighten up. Both of these things are very bad for the voice, coaches say. “Breath is the energy of the voice,” Kazan explains. She adds that it’s best to breathe deeply into the diaphragm, which gives the greatest resonance and power to the voice. 9. Let your enthusiasm show. The previous tips won’t mean anything if you don’t bring passion and enthusiasm to your speech. The best public speakers are confident, relaxed, and interesting — that’s why we like to listen to them. Ironically, it’s those qualities that make public speaking so difficult for many successful people.